The eight students in the group were randomly paired up, and each pair was assigned one of four topics; Digital Footprint, Cyber Bullying, Social Media and Texting. Each pair of students worked independently on their area of the website, with a little guidance from their mentor. The aspect of this work that was particularly impressive was that the content of the site was entered, proofed, and published within two periods. What this success also indicates is that other staff, who may be thinking about the possibility of creating such a resource with their students, can be very confident that the learning curve is not too great for our students and that there are clear benefits for student learning. When shown the result of the learning, the College’s Director of IT Sam McNeill suggested sharing the website with a class in our Preparatory School. 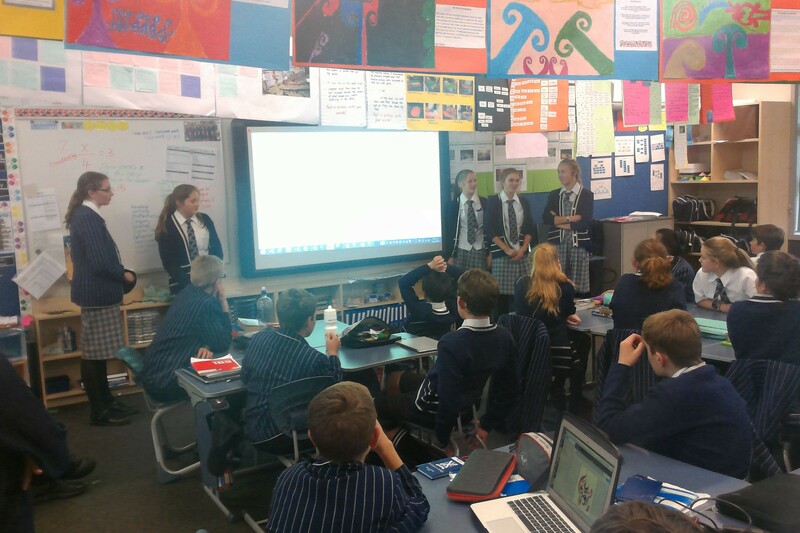 One of our great Year 8 Team, Mrs Preston, jumped at the chance and recently 5 of the Te Waka group presented their website to 8C. It was really pleasing to see students speaking about their learning, and be able to articulate their learning to a different audience and respond to their lines of questioning. This entry was posted in Digital Citizenship, eLearning, Preparatory School, Technology and tagged Collaboration, Connecting with the Community, Digital Citizenship, eLearning, Information and communication technologies in education, Preparatory School, St Andrew's College, Student engagement, Student Work, Technology by Tom Adams. Bookmark the permalink. Reblogged this on Gamification, E-Learning.